Those were the suggested rules I was told to embraces when I found out I was going to ExpoWest. I knew it was going to be a fun experience, but I also knew it would be a packed weekend dedicated to doing my job correctly–for myself and for my readers–to see and find what’s new, what’s changing, meet some of my favorite vendors, ask questions and listen. 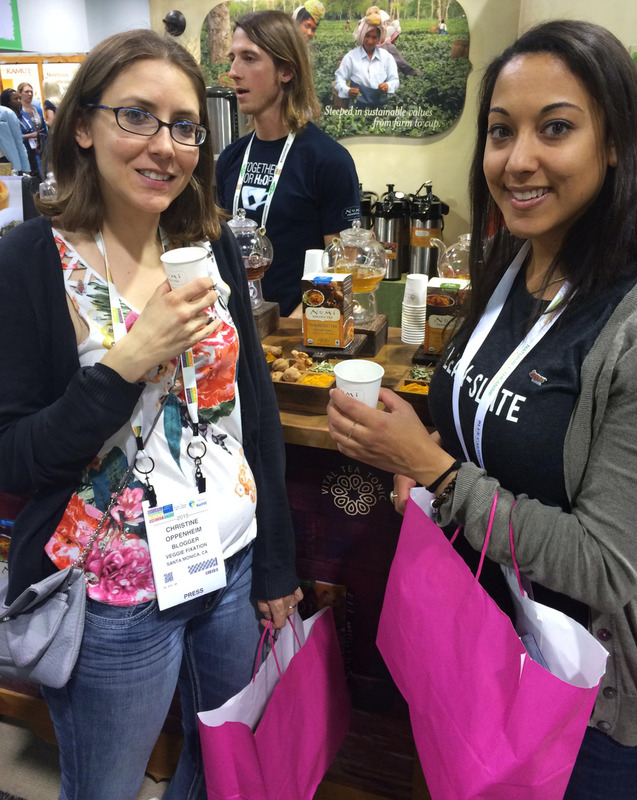 ExpoWest is BIG–convention center PLUS two hotels big! I had two days to conquer it. Mind you, not all the vendors at Expo are vegan; they allow what they consider “natural” vendors to exhibit, but I would argue against most of them. Please tell me what’s natural about harvesting crickets for cricket flour? Or having processed sugar as a second ingredient in your “naturally” flavored water? But I wasn’t there to be an activist, I was there to enjoy the companies that were progressing forward and promoting Klean Karma. A New York based brand that rivals Good Bean and Saffron Road. The ingredients are simple, the flavors are delicious and the crunch is there. I wasn’t completely overwhelmed by the flavor of too much salt, which is a huge plus. I’d like to see this brand on the West Coast as another tasty protein packed snack alternative. I’ve been a big fan of Bitchin Sauce ever since I found them years ago in San Diego at my favorite farmers market. The owners are hilarious and the brand pulls off the right amount of sass to separate themselves from the rest. They are the only one I know on the market that uses almonds as their base for their sauces instead of chickpeas. My favorite flavor: Bombay. I have used it on everything! New item– their impressive line of bars. The ingredients are just as simple as their sauces while still being able provide ample flavor. Can’t wait to see these guys on my local markets shelves. 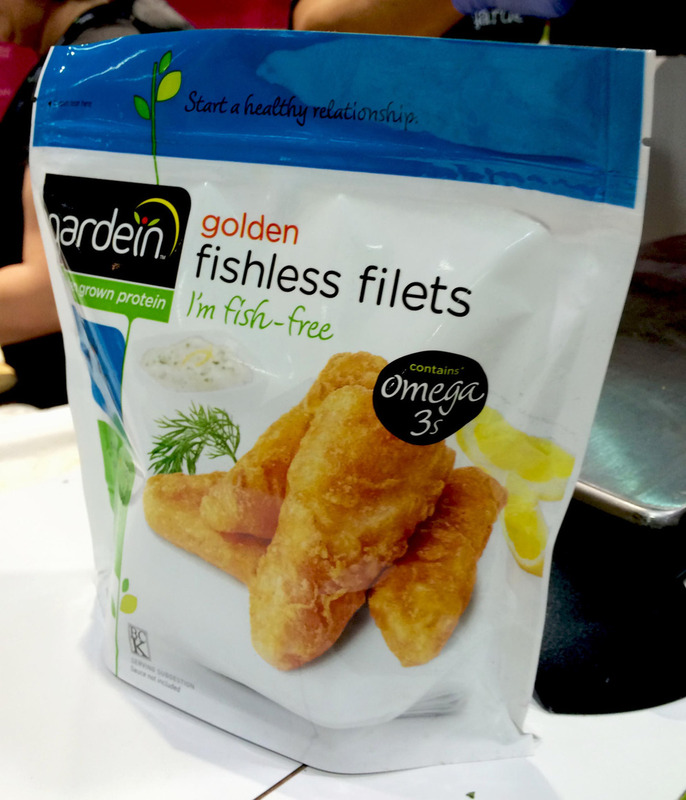 So I haven’t been able to bring myself to buy a whole bag of Gardein’s Fishless Filet’s or Crabcakes yet, but I was happy to try them at Expo. Everyone was right. They are crazily similar to fish sticks! The textures and the flavors are spot on. The samples contained vegan tarter sauce at the bottom which was dead on. The whole bite reminded me of the time I was back in Santa Barbara having fish sticks on the pier…mind you, years and years ago. I’m not sure if that’s a good thing, but I know for most vegans/vegan-friendlies, this will be a better option to have around than caving for real seafood. I might as well continue the fake meat rundown. Here is Tofurky–a staple in the vegan world since the dawn of day (sorta). They have taken their wheat meat’s to another level with prepackaged flavored shredded meats. I’m not gonna lie, I enjoyed the flavors, but I just can’t bring myself to indulge fully into this option on a daily basis. It contains both soy, wheat and more calories than I need for a single serving. This would be a great product for transitionals. They brought their A game again this year, transforming their booth into a Beyond McDonald’s esque restaurant. Clever clever. They were slinging their new Beyond Beast burgers and Chickn’ Tenders. I'm loving the ingredients in the burger and the chickn’ tenders were tasty, but I was disappointed in the fact they used wheat for texture. I feel they could of used a few other alternatives to keep it a gluten-free option or atleast a wheat-free option. Thumbs down for me. I’ll stick to the regular strips. I will definitely say the Beyondmeat team was by far the most engaging, friendly, informative and fun! They installed a photo booth and invested in 4pm Happy Hour! Let’s just say, it created a ton of foot traffic with the best individuals at Expo. HOLD THE PHONE. Another booth I spent a chunk of my time at was Follow Your Heart. 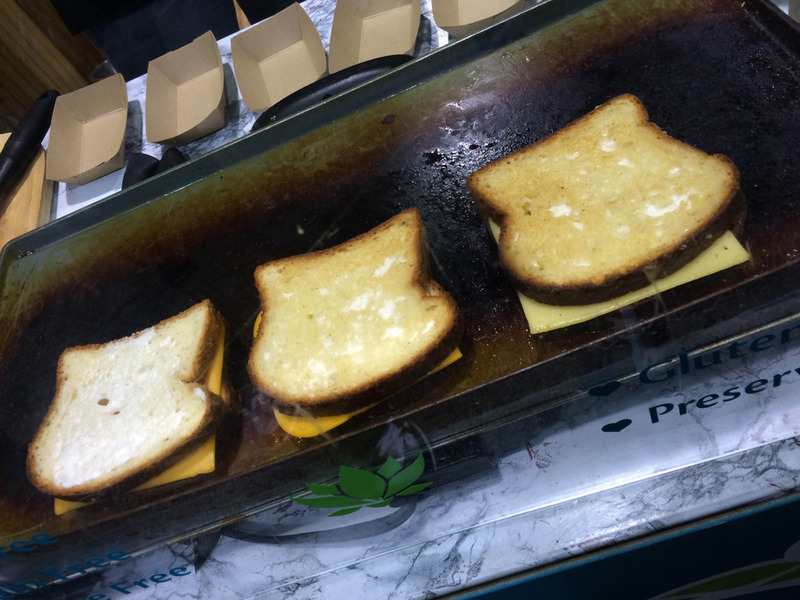 They were killing it with their sandwich and grilled cheese bar! I had heard rave reviews about the new, brought-back-to-life cheese and the new gluten-free brioche bread that it had become PRIORITY status on my list. It did not disappoint! I tried all the options; mozzarella, provolone, herb and american as wells as the gluten-free brioche (grilled and not grilled). 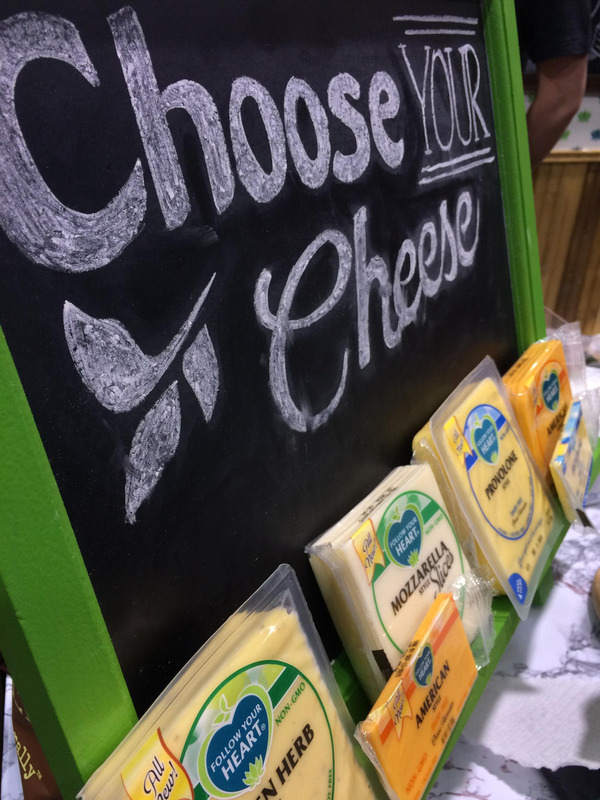 I was highly impressed with the flavors, especially the provolone and how little ingredients they used to create these highly improved cheeses. 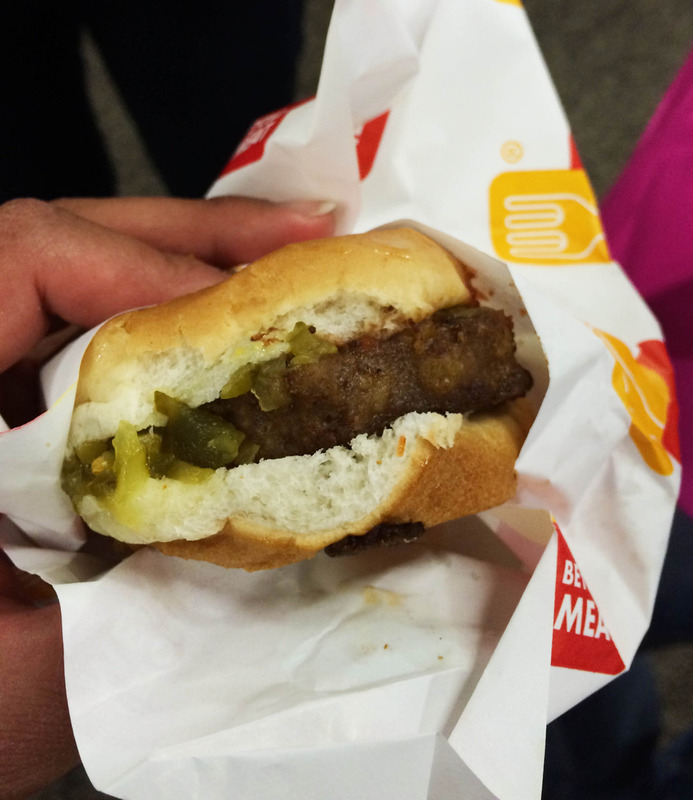 For me, this beat the publicized Chao cheese hands down. I think this cheese is even better cold than it is grilled, which tends to be the opposite for most store bought vegan cheeses. I may have made multiple trips…but now I feel I can thoroughly say, GO GET THIS CHEESE! Let’s take a probiotic break, shall well? After all the sampling, I needed to check back in and realign. Wildbrine is my one of my favorite sauerkrauts on the market. I add them to salads, sushi burritos, bowls or I just eat it by itself. Fermented natural goodness. I recommend adding in sauerkraut/kimchi to your daily diet for internal balance. Oh happy day! I was hoping their would be an abundance of kale chip vendors…and I was correct! Do you know, I’m slightly kale chip and now, broccoli and brussels sprout obsessed? Well, I am. So I was sooo happy to be able to try old and new vendors. This Idaho based company Veggie Evolution has one hell of a crispy, lightly flavored, kale chip on their hands. I can appreciate a lighter option that still maintains the crunch integrity. Veggie Evolution has an array of flavors; including a line of savory veggie crisps. Isn’t their packaging adorable? Brad‘s is one of the few kale chips that has made it’s way into my local grocery store and not just Whole Foods or Sprouts (oddly I haven’t been able to find them in my local Whole Foods) making it an easier option to grab versus a bag of chips. Yes, the price point is higher than a bag of chips, but they have been able to provide more chips per container than most. As well, after talking to a rep I found out they are planning to add 20% more and lower the price point! Um, winning! Oh my. I normally can’t partake in Rhythm’s kale chips because they have tahini (sesame seeds), but these bites did not! They are not on the market yet, but I’ll be sure to look out for them. This happens to be another brand I have been able to find at my local grocery store and not just Sprouts or Whole Foods. I’m loving the new trend. Let’s just make all chips dehydrated veggies! I can get behind that movement. Let’s also lower the price and put them in jumbo packs. Talk about a company that pushes the flavor boundaries; Chili Pumpkin, Tamarind Apple, Lemongrass Chili, Dill Pickle, etc. They also have the above Cheezy Herb ( my personal favorite) and Ranch for those who like to live within their four walls. I was really excited to see Numi Tea showcasing one of their newest lines, Turmeric Tea. Numi has Klean-Slate written all over it. 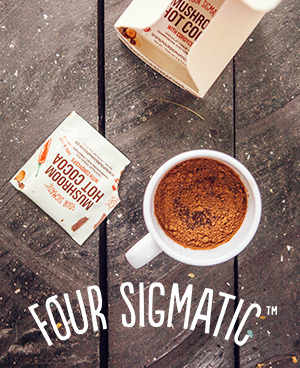 Not only do they engage in eco-friendly, safe packaging (most tea’s do not as they are produced using modified corn or plastic), they are organic, non-gmo and abstain from “natural flavors”. The reps at the booth were very knowledgeable and invited us to a taste-testing flight. With a day full of goodies, treats and sample, this was the perfect reprieve. Turmeric is know as a powerful anti-inflammatory and a strong antioxidant. The teas were subtle, delicious and warming. I highly recommend! The name says it all, it’s yumbutter. I was really digging the flavors, the portability and the company’s powerful FEED A CHILD IN NEED message. Of course I feel the need to warn you on the calorie content, but it’s almond and/or peanut butter so it’s really no surprise. The omega and the protein content is high making it a great choice for athletes and vegan travelers. Here is the only brown rice wrappers on the market that are gluten-free! A great alternative option for your tasty spring rolls.